Well, here it is! 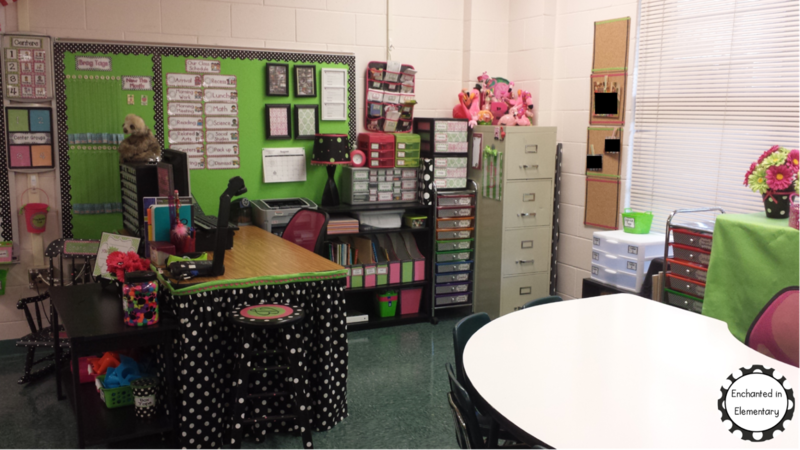 I have FINALLY finished my classroom and have the pictures to prove it! 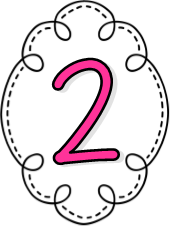 For some strange reason it took me longer this year than it ever has before, even though this is the first year I am returning to both the same grade level and same room! This is the inside view of the front door. Last year we read a story in our reading series where the characters were decorating their classroom and the writing prompt that came with it was- "What could you do to make your classroom a brighter place?" For the most part, my poor little friends were at a loss! 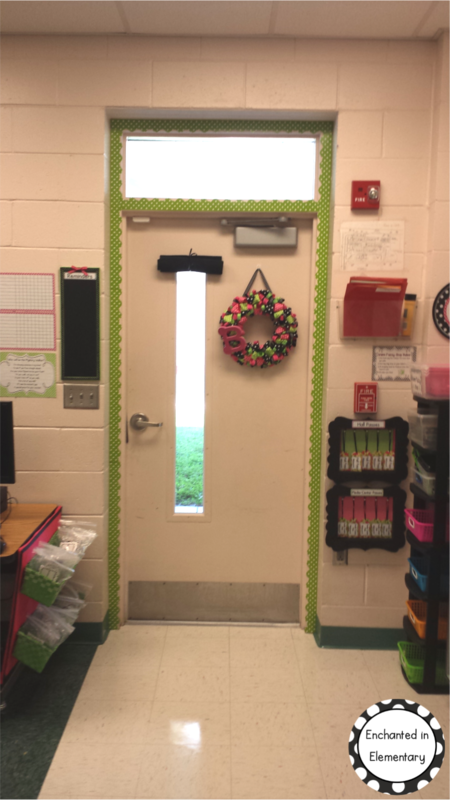 I did have one student who came up with the idea for adding border around the front door and he was SO excited when he came in the next day to see that I had added it! 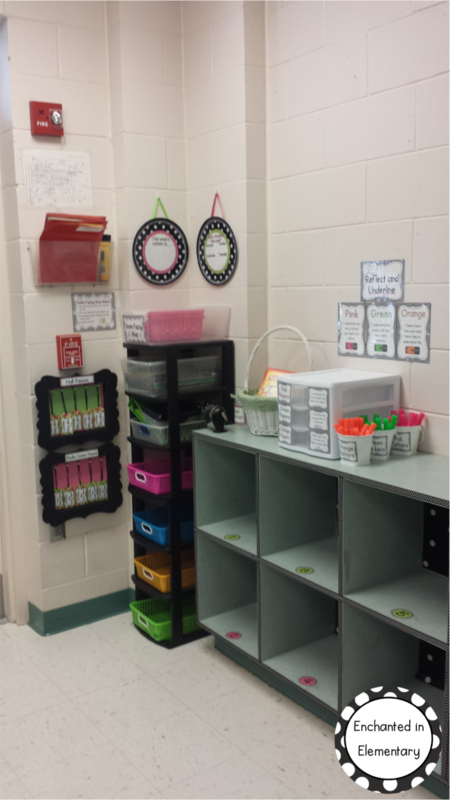 Here we have my hall/media center passes, guided reading baskets, snack basket and turn-in bins. 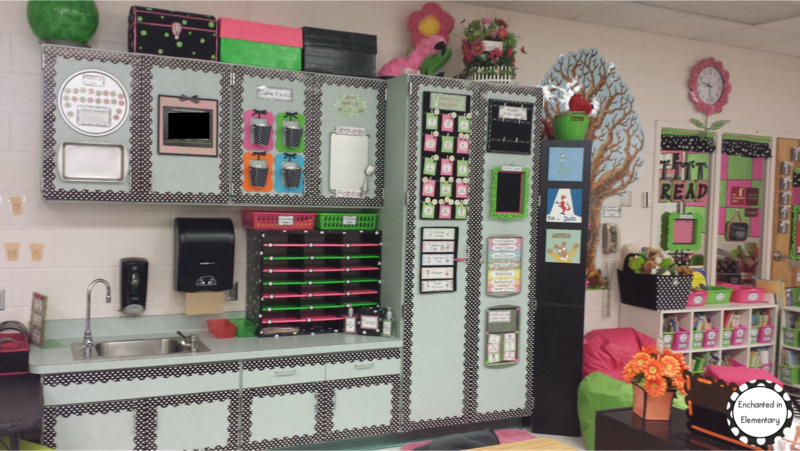 This is the back wall of my classroom. 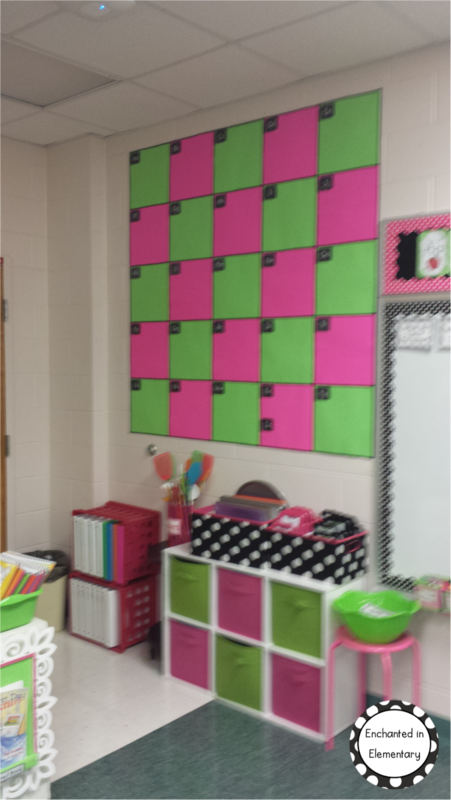 I have three "bulletin boards" I created out of fadeless paper with scrapbook paper and clothespins for hanging work. I have the pocket chart that my mom made me a couple of years ago for content area vocabulary and our supply station. 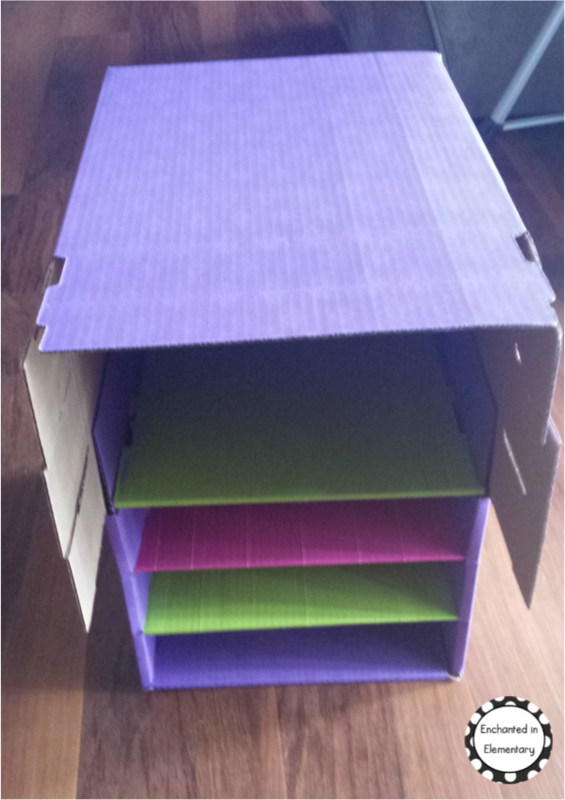 This is a close-up of the cubbies, I used ribbon along the edges to fancy them up a bit. 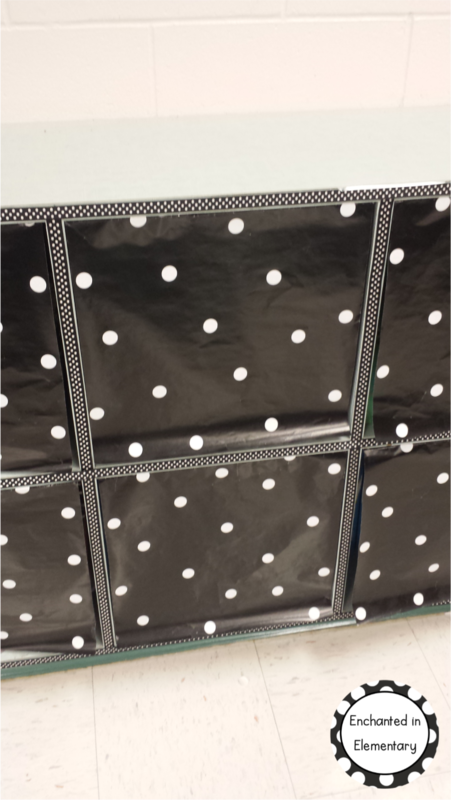 The back of the cubbies is covered with black wrapping paper that I added polka dots to. I keep textbooks and our reading series materials in the extra cubbies. I covered them with the wrapping paper so that it looks a bit neater. Here is our supply area. I am very picky about how we keep supplies, especially extra crayons! 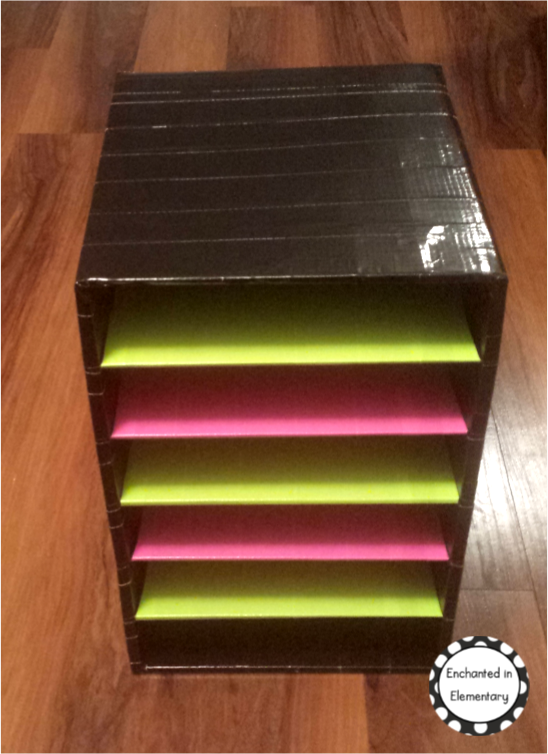 They are organized by color into the small drawers so they are easy to find. 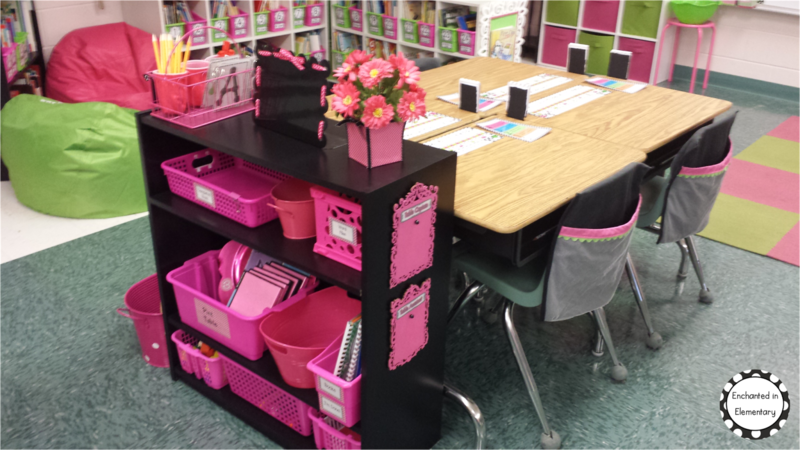 This is our writing/notebooking area. We keep our portfolios here too. Right by my writing center I have my listening center set up. I use the crate seats to store extra supplies and listening center stories. The black on the table is a vinyl table cover my mom made for me last year. We also display our sight word scoops on the wall here. The flower is something I made last year- once I get the mini stickers of my student's yearbook pictures, I add them to the wreath. Here are my supply cabinets. 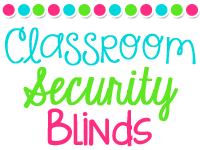 I use them to display classroom jobs, behavior chart, table points, homework club, brownie points, hall of fame, student of the month, related arts schedule, and my noise level chart. We also have our mailboxes here. 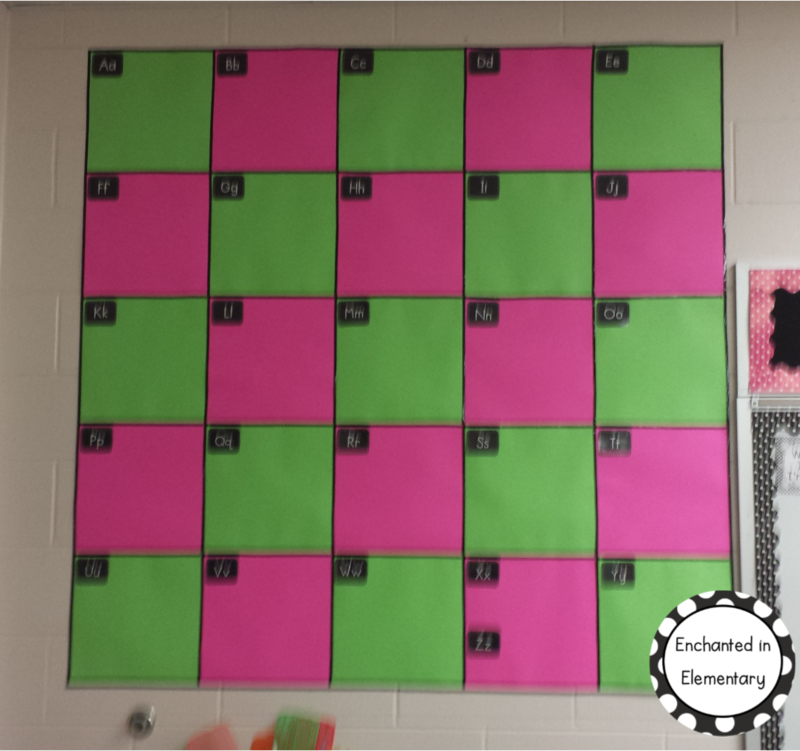 I added the bathmat under our behavior chart because I was tired of the magnets falling apart whenever a student dropped one on the floor. It works wonders! This is my pride and joy, my library! The rug, ottoman, and green bean bag are all new this year. 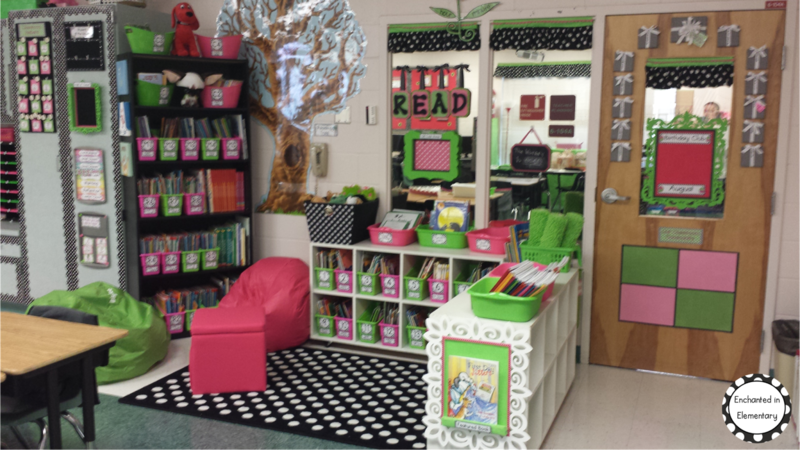 The tree is our reading tree, we add a leaf with the title of every book we read together throughout the year. It is pretty full by June! This is my birthday display. 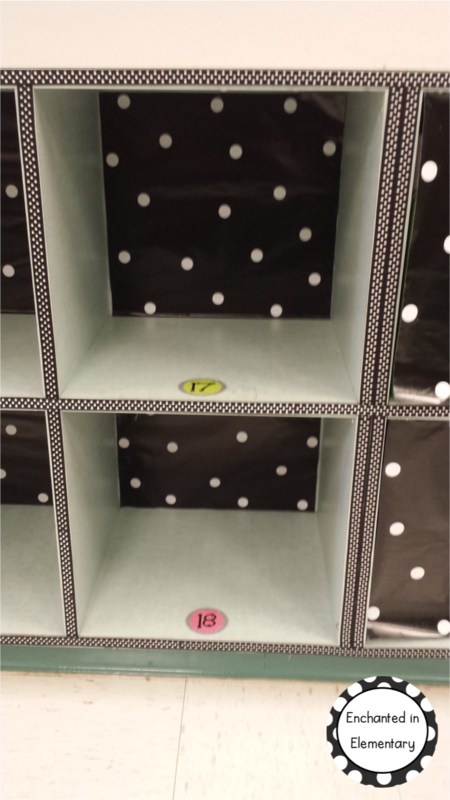 Students get their name and birthdate on a tag on the present for their month. 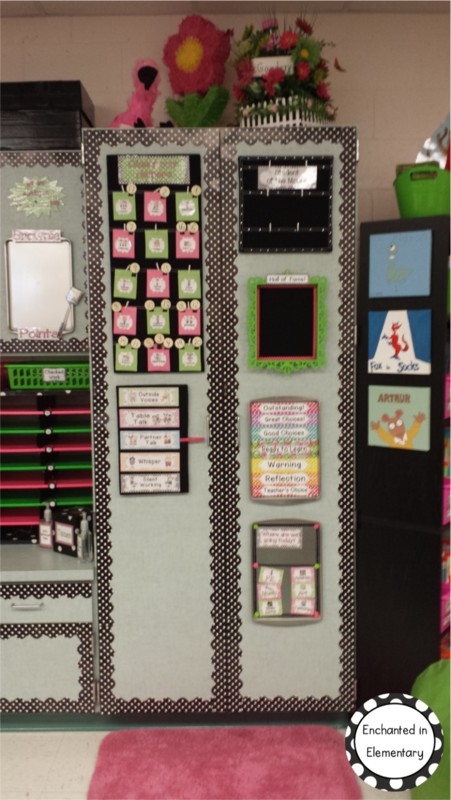 Below that we have my classroom community display. We add pictures throughout the year. That is probably one of the most popular things that kids show their parents on student led conference nights! I will need to get a better picture of this, it came out pretty blurry. 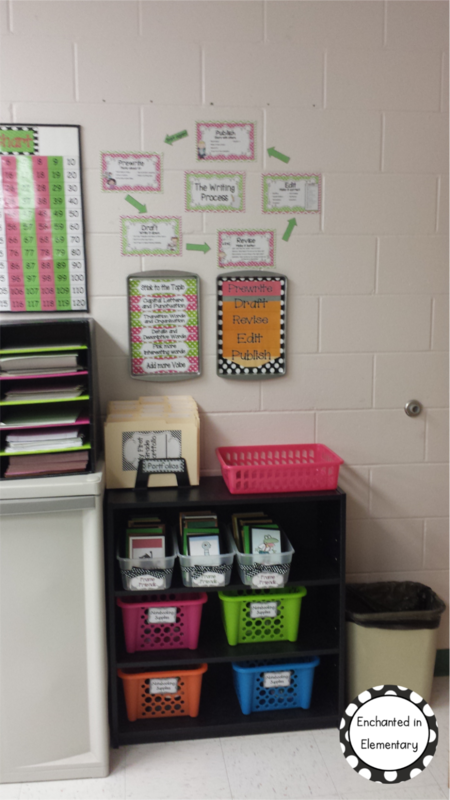 This is my word work station and word wall. 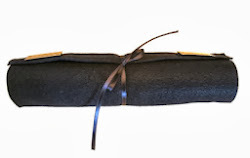 I used scrapbook paper for the back and black giftwrap ribbon to section them off. This is the front board. 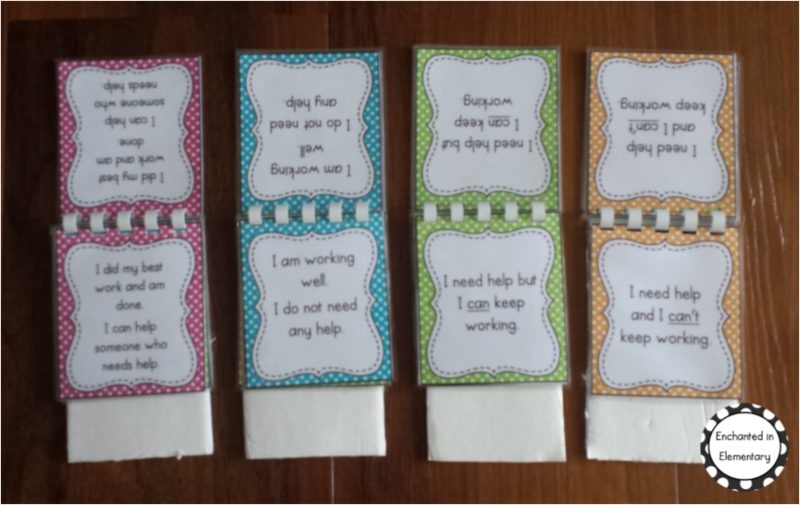 I display my activity direction cards on the far left and the learning goal/scale on the right. 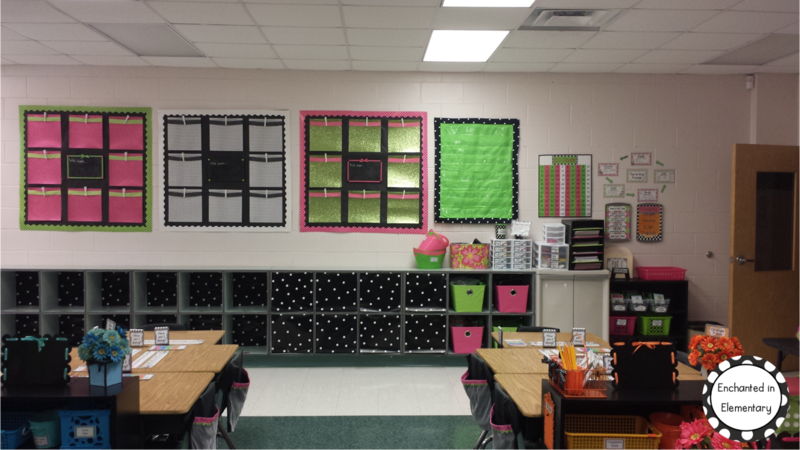 Here we have my center board and center group display. 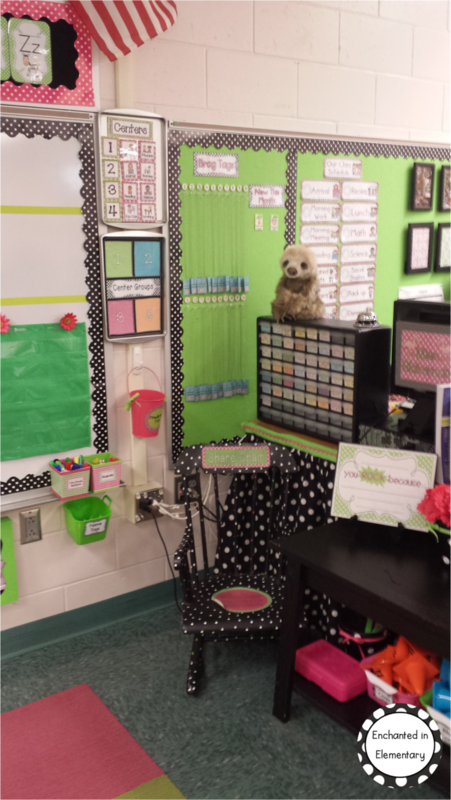 I also have my share chair (which needs a few minor repairs) and my brag tag display. I keep my brag tags organized in the drawers. 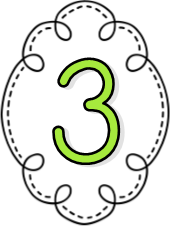 The students are responsible for hanging their brag tag back up on their number at the end of the day. This is my desk area. I keep my teacher stool right next to my desk so that it is close to the rug and perfectly positioned for using the document camera. 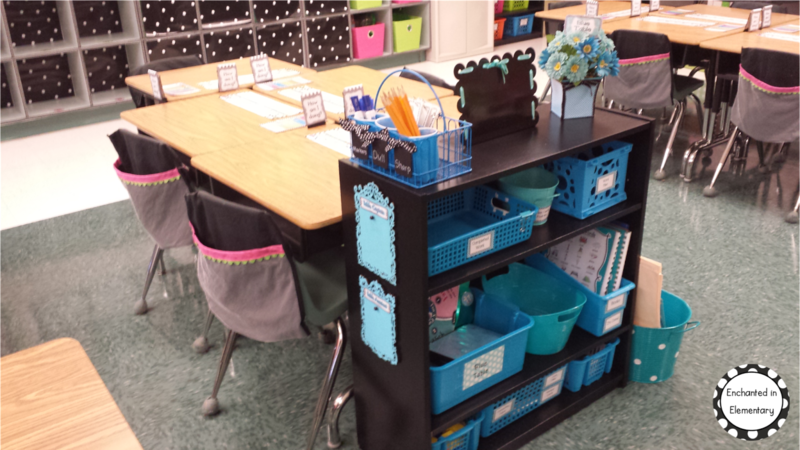 The white drawers by the window are going to be for our classroom tablets. 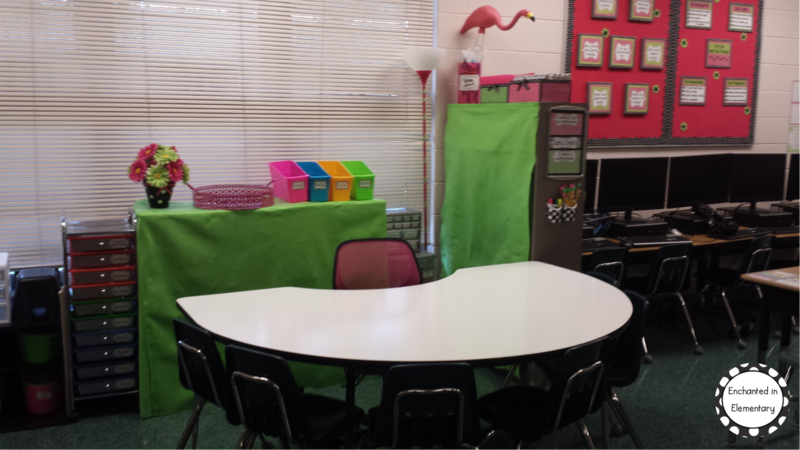 Here is my guided reading area. I have the gigantic science kits covered with the green felt to form a table of sorts. My TEs/materials are stored on the bookshelf behind the felt curtain. 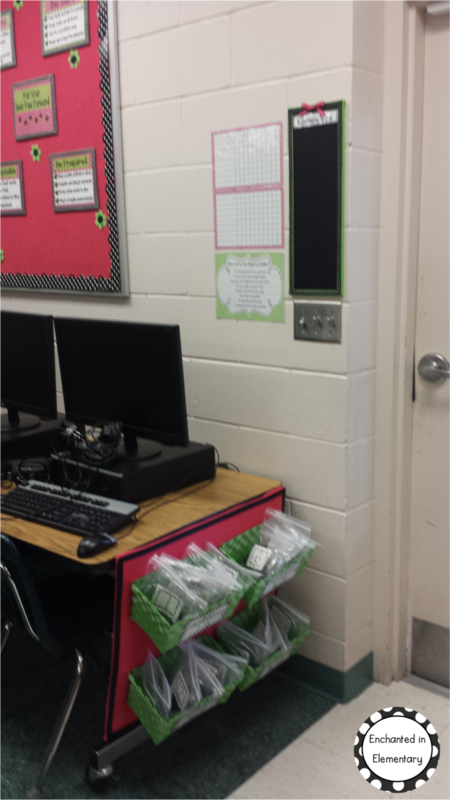 Here are my student computers. 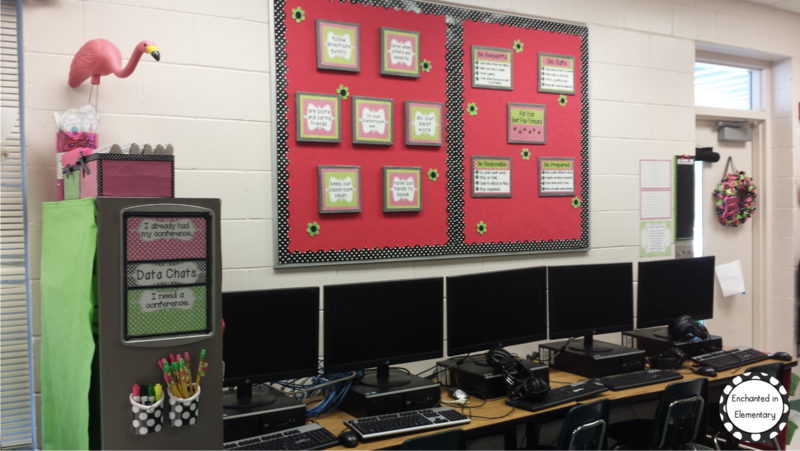 Please excuse the mess of wires, I can't stand setting them up every year so I always leave them until last... :) I have my classroom and school rules on the bulletin board overhead. I like it there because it is something I will never have to change! The baskets are something new this year. I attached them to the felt-covered foam board to store student headphones. I have my mystery walker poster/chart on the wall as well as my new reminder board. This is the group table. 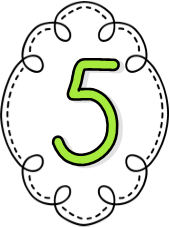 It is most often used for guided reading extension. My center groups are not the same as my guided reading group, so I just send my guided reading group here to work on their extension activity. I also use it on those days when we have to split a class and I end up with extra students. The pocket chart stand (laundry rack!) holds chart paper on one side and our 120 pocket chart on the other. Last, but certainly not least, I have my table supply shelves. 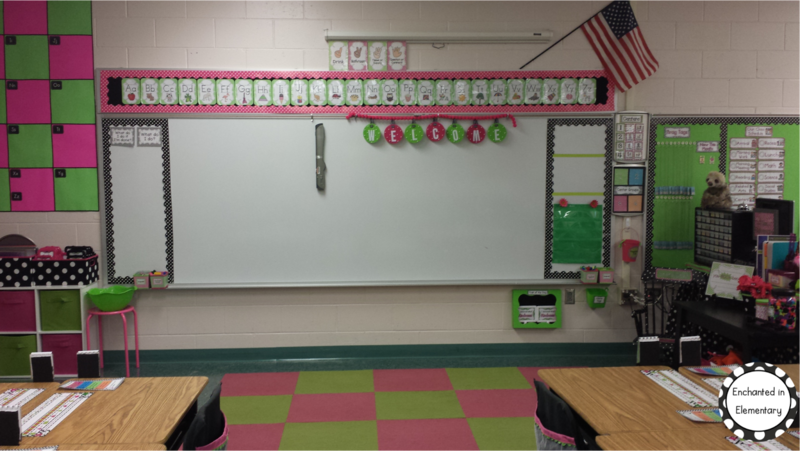 I have made some modifications to them this year (including a removal of the polka dots/fresh coat of paint), but you can read about how I use them here . Well, there it is! 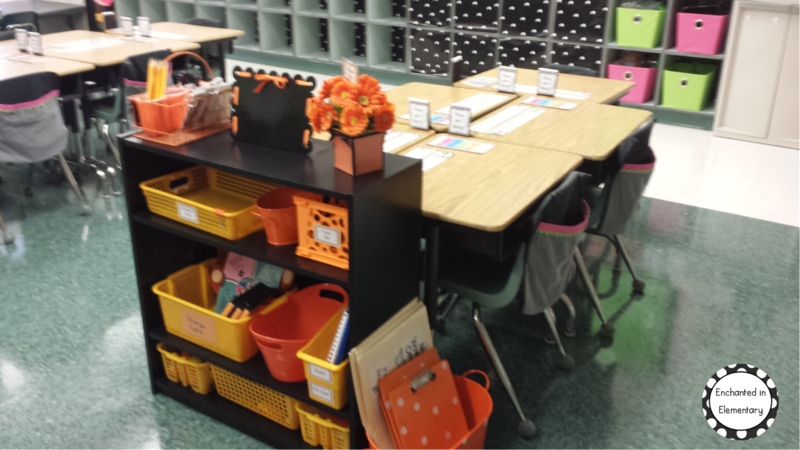 I am really happy with my classroom this year. It was a TON of work to get set up, but the kids and parents have all seemed to like it so far! 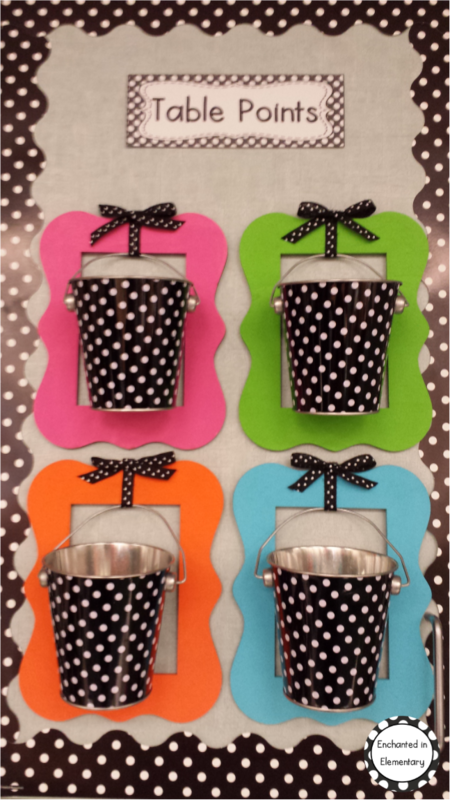 Monday Made It- Table points, Wreath, Paper storage and a back to school freebie! 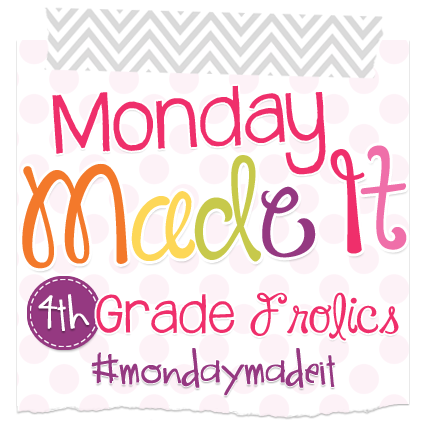 I'm linking up with 4th grade frolics for my last Summer Monday Made it, I go back to school today! 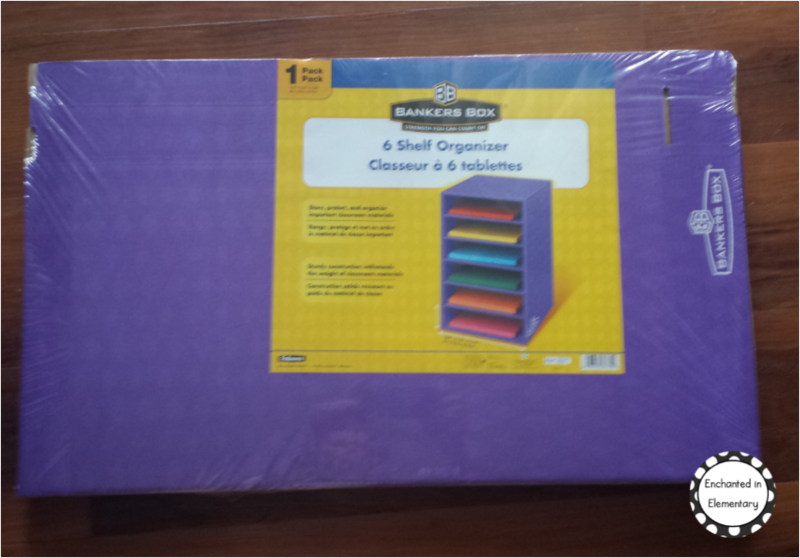 I found this cardboard shelf at Target a couple of months ago and wanted to use it for storing writing and construction paper. 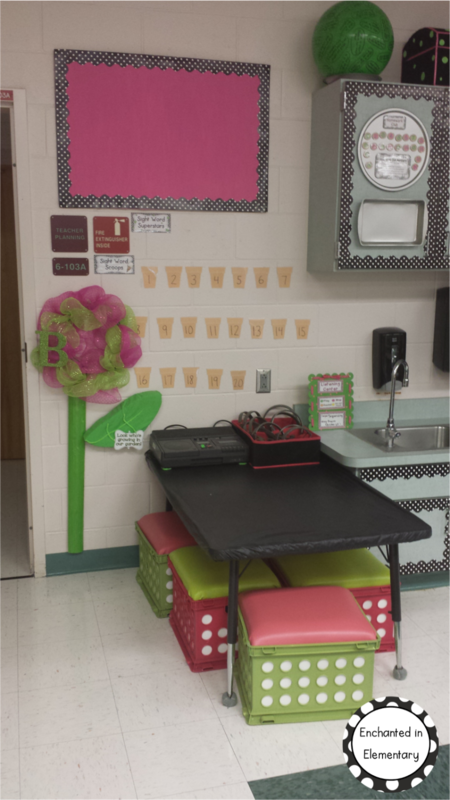 I wanted to make it a bit sturdier and make it match my classroom, so I turned to duck tape. 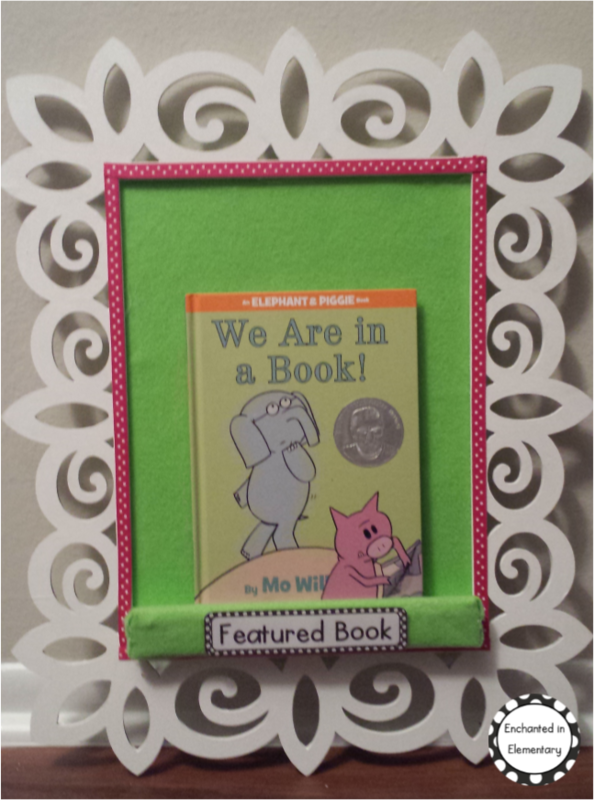 I started by alternating pink and green on the shelves and putting them in the frame. I covered the outside with black duck tape and it was done! It feels pretty sturdy and holds quite a bit of paper without any sagging in the middle. I don't have any before pictures of my next couple of projects, but I think the after shots look pretty good! 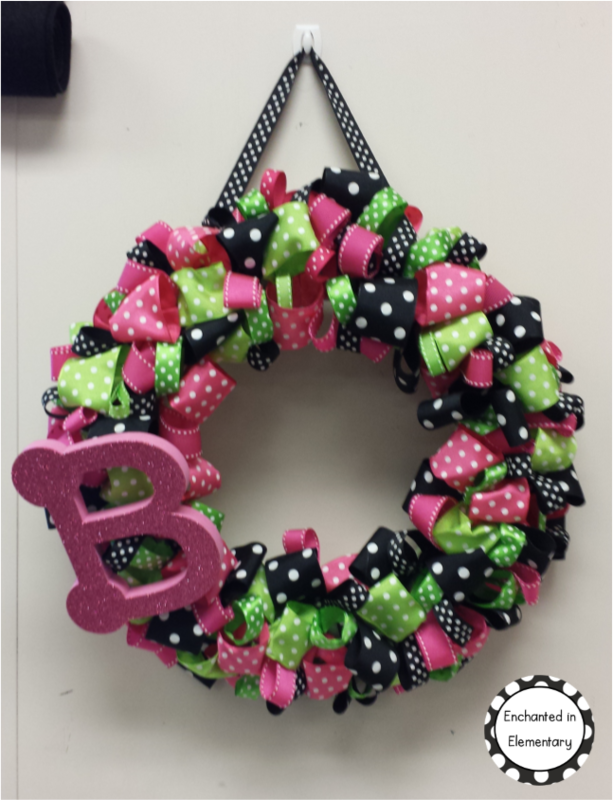 For this wreath, I took a plain green Styrofoam wreath and hot glued loops of ribbon until it was full and fluffy. I used nine different kinds of ribbon and a full bag of glue sticks. It also took several hours to complete, but it was so worth it! I have it hanging on the inside of the classroom door. Next up I have my new system for table points. 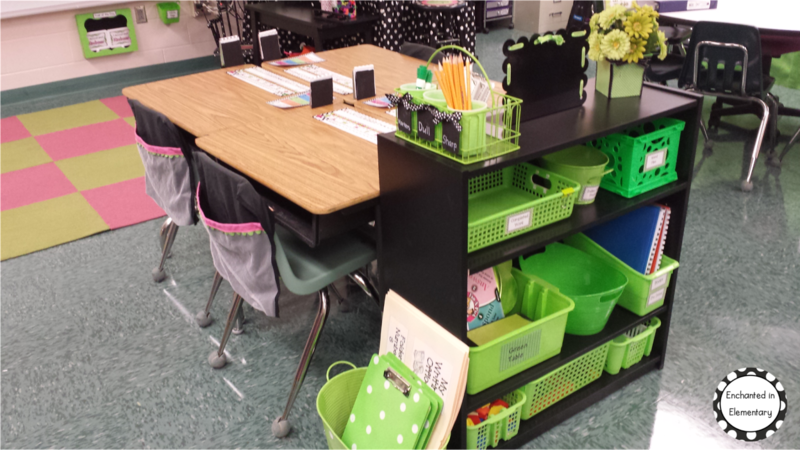 My students earn table points by working together in their group, being prepared, keeping their table neat, working quietly, etc. I have tried a couple of different systems for keeping track of them, but they haven't worked as well as I would like. I was taking a quick break from moving furniture in my classroom last week when I noticed the wooden frames that I had painted and the buckets I got at Target. I attached the buckets to the frame with the ribbon, added the bow, then used Velcro to stick the frames to a cupboard door. I plan to add a pompom (warm fuzzy) each time a table earns a point. We count the points up on Fridays and the students from the winning table earn a positive referral that could result in a positive phone call from the principal! One of my students got picked for one of the phone calls last year and he was SO excited, so it is a big motivator! 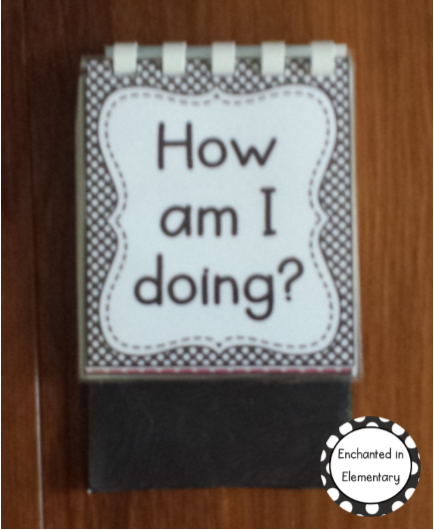 My last made-it for this week is an activity that I am going to be using during the first week of school. 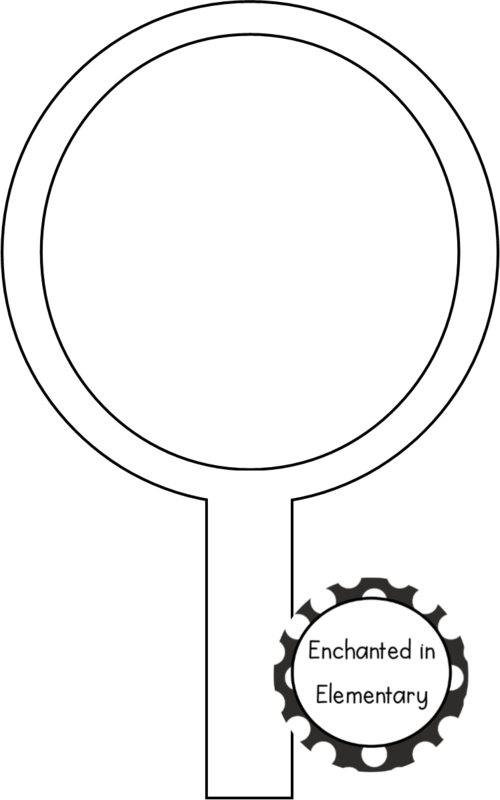 The students will draw a self-portrait in the middle of the blank mirror and decorate it with pictures of things they like. 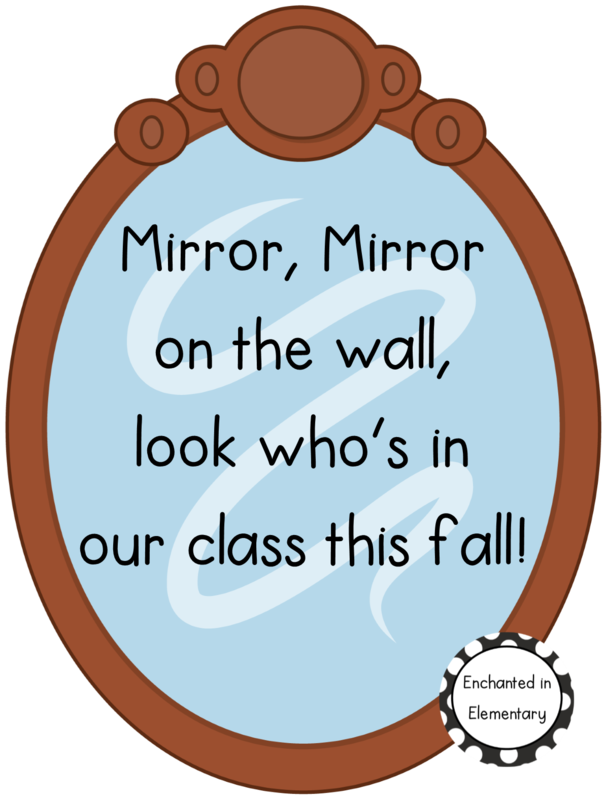 We are going to display the poem and mirrors on the window outside our classroom. This set is a freebie in my store, get your copy here! Well, that's it for this Monday. I am off to school for our first day back meetings and classroom set-up. I was working on my room all of last week, so I should be ready to post the new pictures this week. 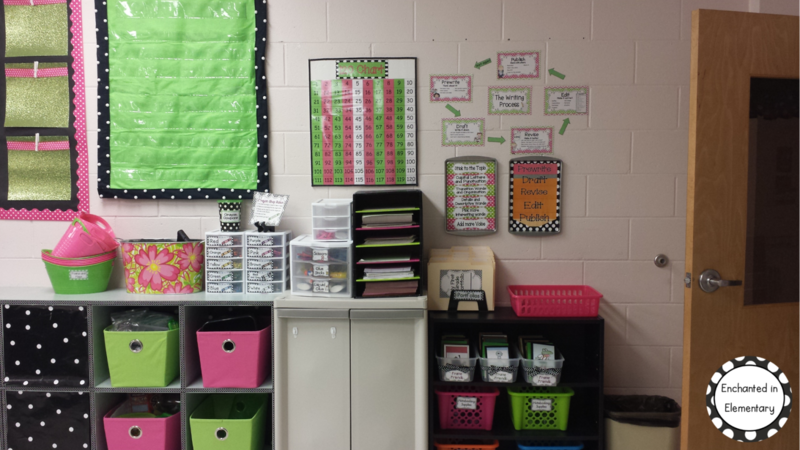 I am quite pleased with my classroom so far and can't wait to share! Monday Made It- Table flipcharts, Read aloud display, Character education, and treasure box! 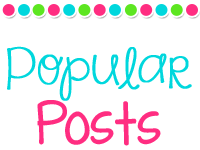 I'm linking up with 4th Grade frolics for my favorite kind of blog post- Monday Made It! I am starting this week with a project that I am particularly proud of- my new table flipcharts! I've seen something similar in a couple of teacher supply catalogs, but didn't want to pay that much for a couple of sets, especially when I didn't like the colors or text! I was never able to decide on how I would make my own until I got my comb binding machine this year and now I have done it! 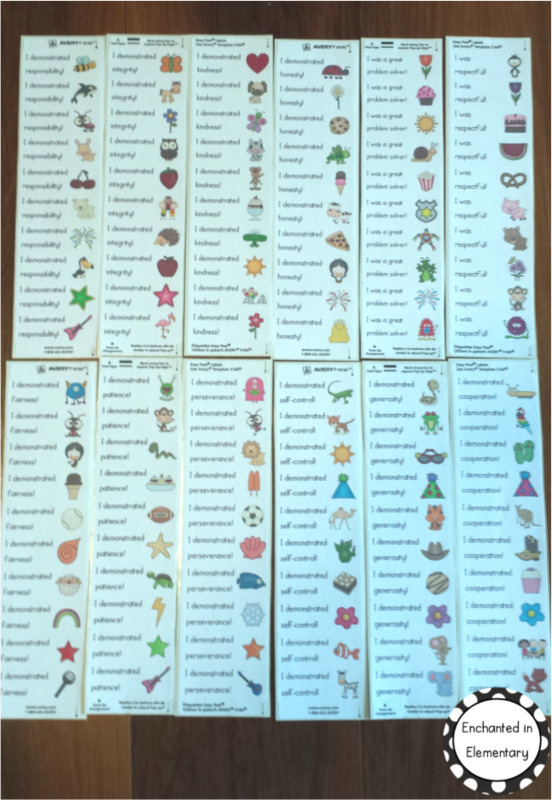 I started by making the cards on the computer, I printed duplicated of the four different categories so that they can be seen on either side of the flipchart. I cut them out and laminated them back to back. 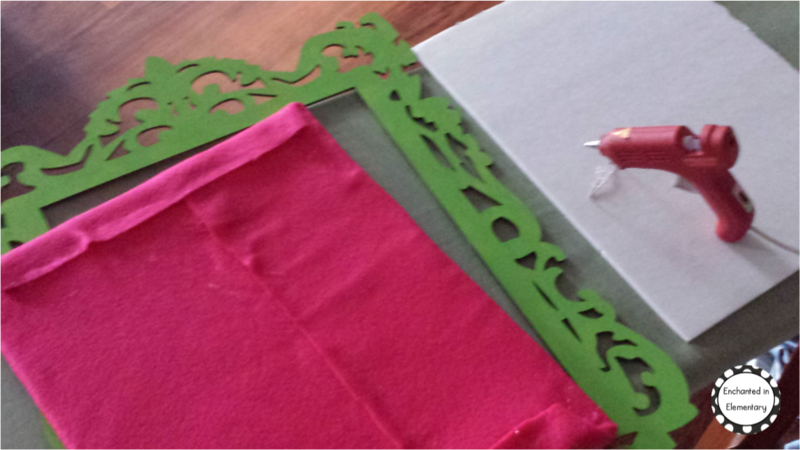 Then I cut come of the combs from my comb binding machine to fit the cards and bound them. My last step was to take some foamboard and glue the last page to it, paint the foamboard black (to prevent pencil scribbles, which are bound to happen at desks...) and attach the Velcro. 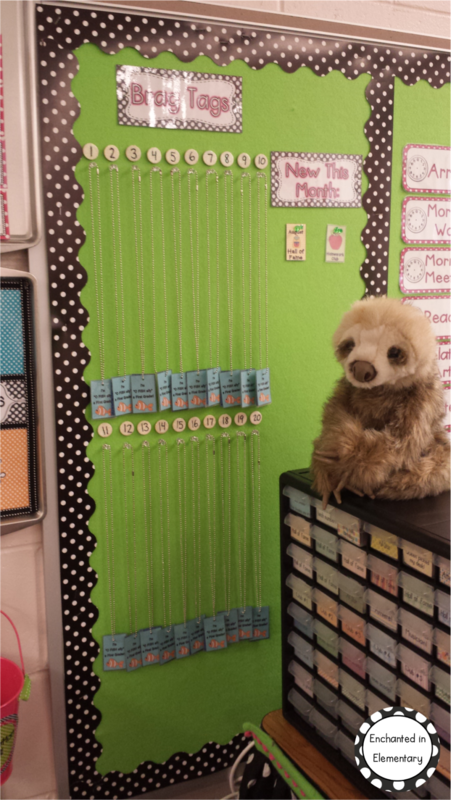 I plan to stick some Velcro to all of my student desks so that they stick up in one of the top corners. 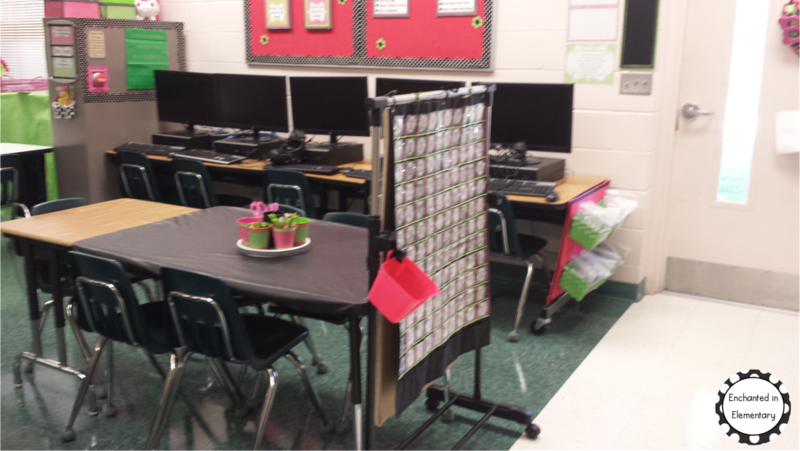 I will be able to see how every student is doing from anywhere in the room. 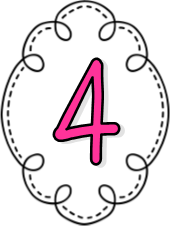 I added the pink card so that I can have students who are finished coach the students who may be struggling. I've only completely finished a couple so far and they were pretty time consuming, so I have to get a move on to finish them before school starts on the 18th! 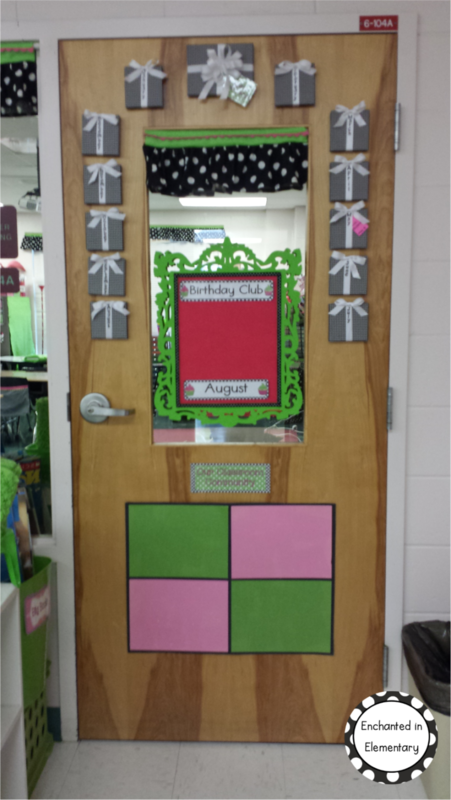 I wanted a way to recognize student birthdays in addition to the wrapped canvas presents display I used last year, so I decided on the birthday club! 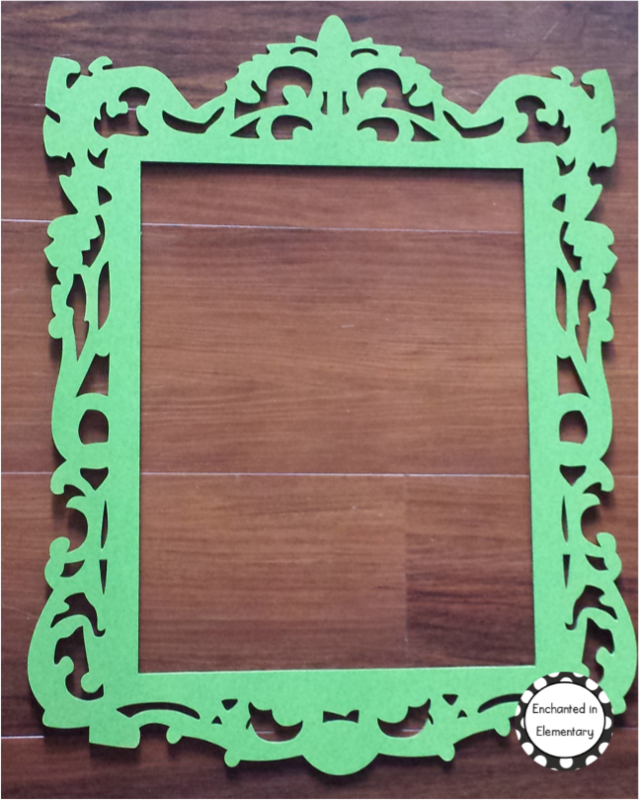 I took an unfinished backless frame and painted it green. Then cut some foam board to fit and covered it with pink felt and added the signs. 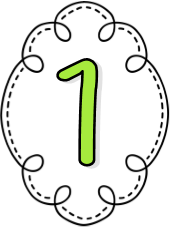 I plan on taking a group picture of the students who have a birthday that month for the center. 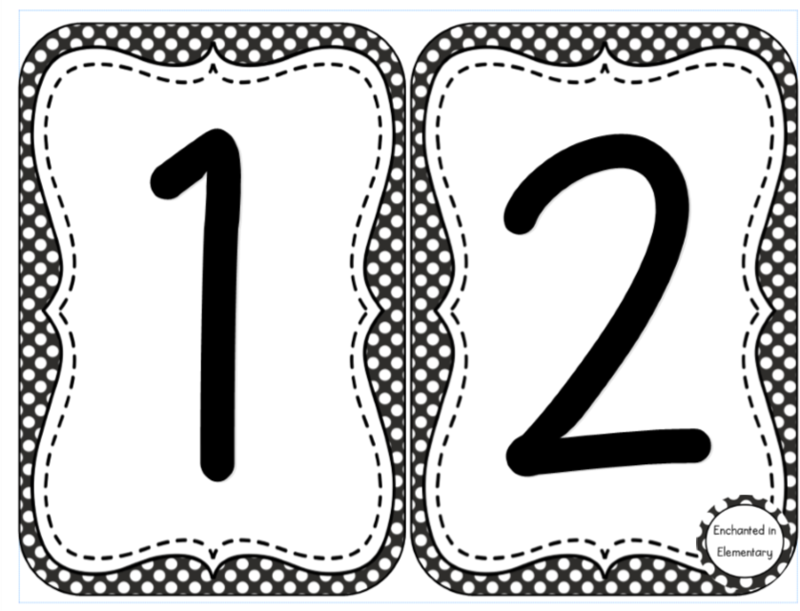 They will hold these cards to show the date of their birthday. 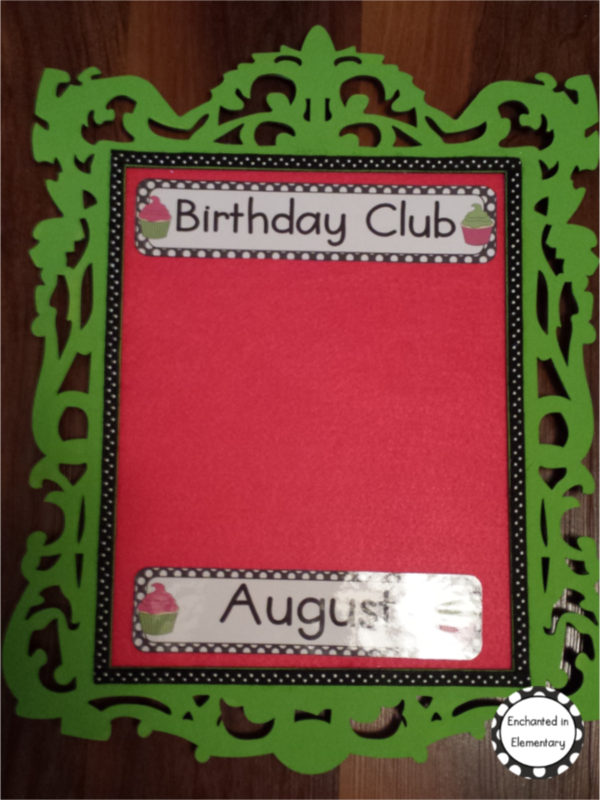 My next project is similar to the birthday club frame, with an added component. I wanted a display for the library that would show off the read aloud for the day, but didn't like any of the easels that I could find in stores, so I decided to make my own! 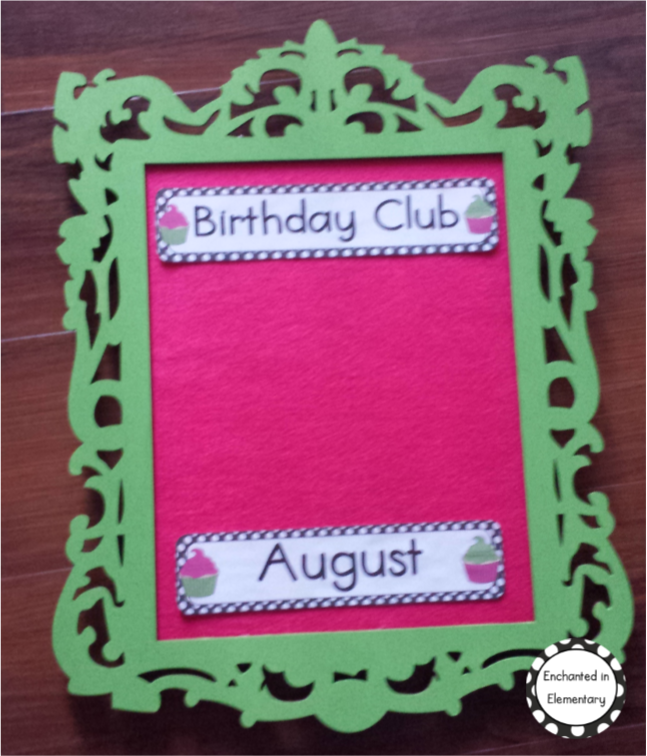 I used the same kind of unfinished, backless frame as the frame for my birthday club display. 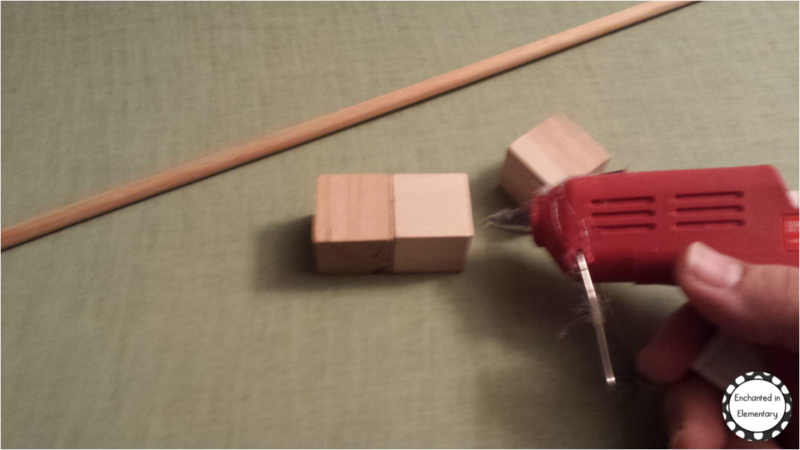 Then I took 1 inch wooden cubes and hot glued them together. 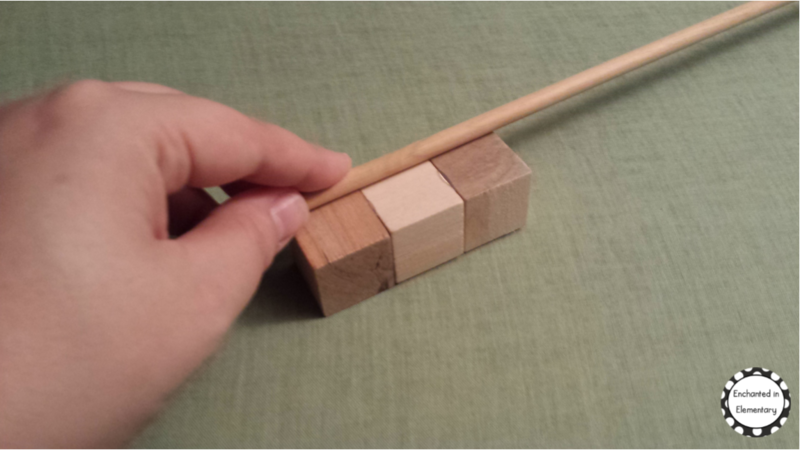 I used a dowel glued along one edge to make a lip so the books wouldn't slide off. 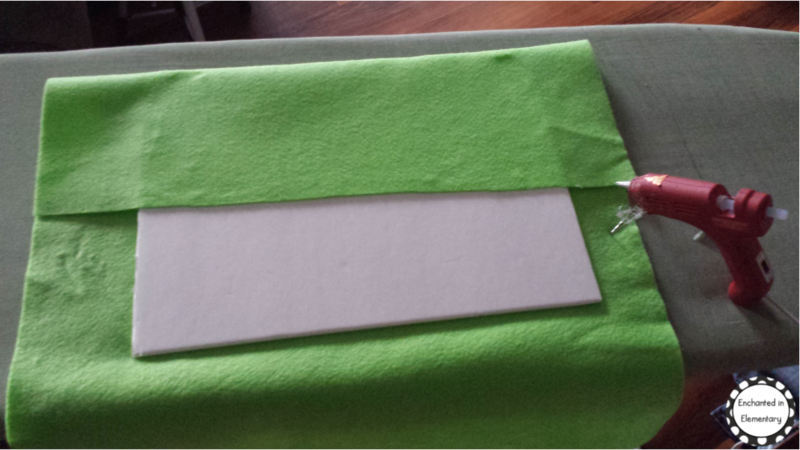 Then covered the foam board back and base with felt. I glued the foam board to the back of the frame and glued the base on with massive quantities of hot glue! Normally the ribbon would be purely for decoration, but in this case it covers up the extra layers of glue I added underneath the easel base! 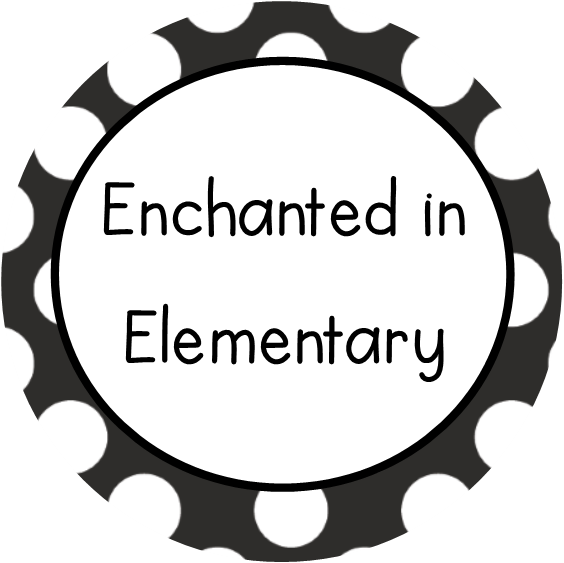 I think this is going to look great hanging in one of my library windows this year! 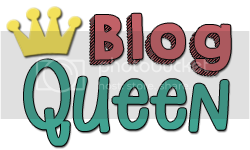 I am very big on character education and I wanted a way to recognize students for specific traits more frequently than I do with student of the month. Here is my solution! 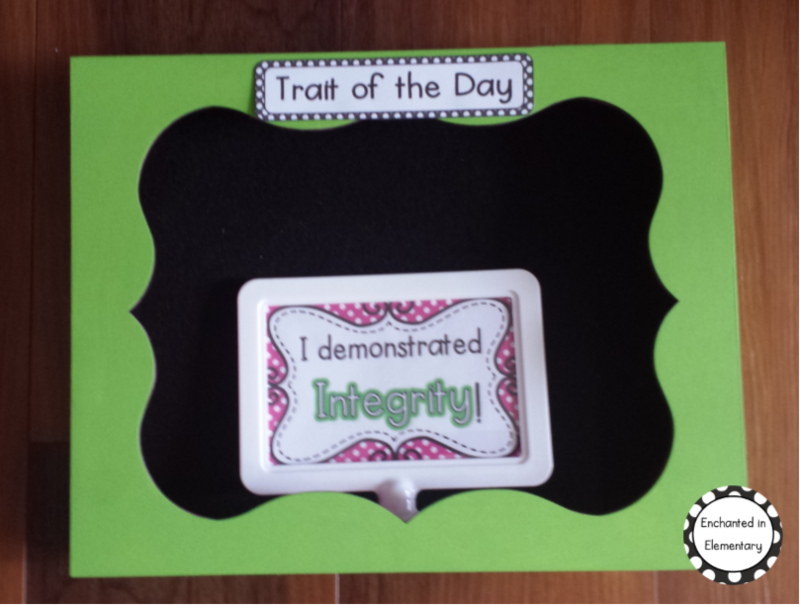 I am going to pick a trait of the day and we will discuss what it means and role play during our morning meeting. I will pick one or two students who demonstrate that trait during the day and they will get to keep one of these signs on their desk. 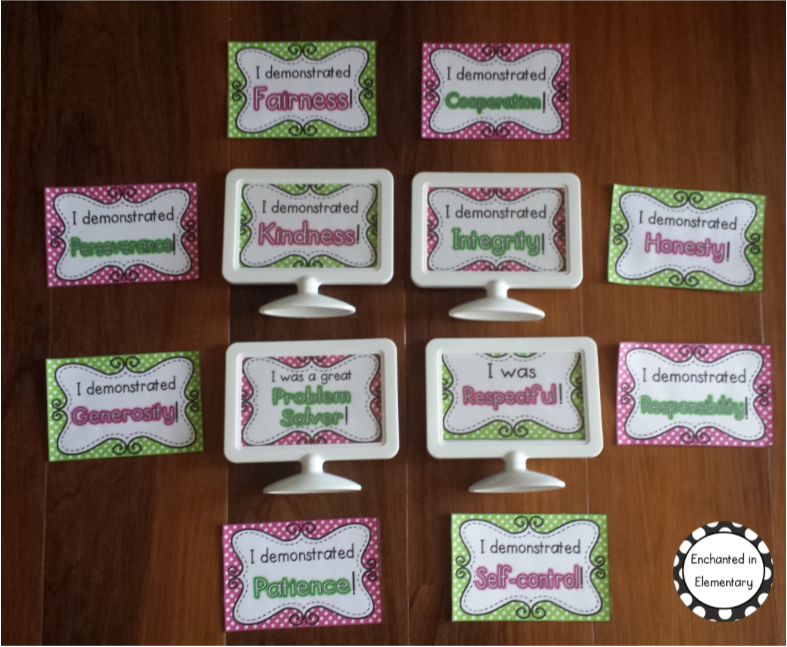 I also wanted the students to be able to go home and share their success with their families so I made these stickers using address labels. There is a set for each trait. I just picked a bunch of different graphics so they can choose the one that they like best. 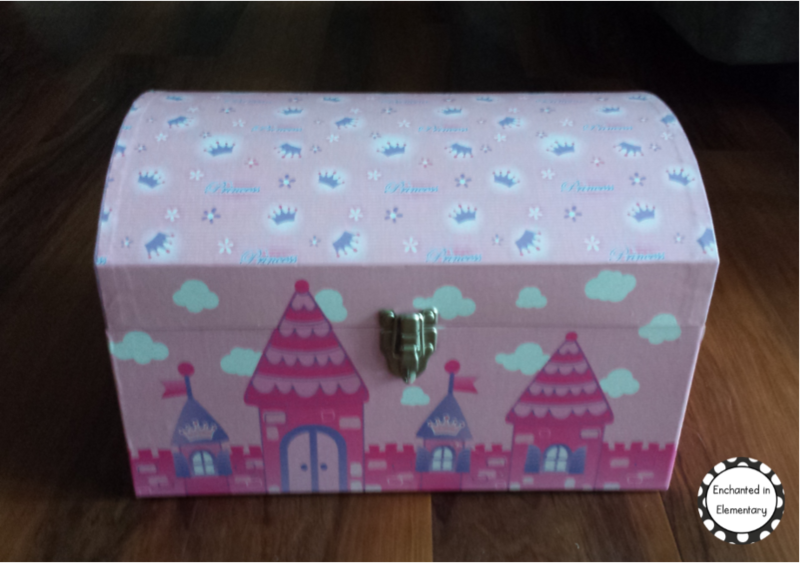 I have been looking for a new treasure chest for next year, preferably one with a lock due to the overwhelming problem with theft I had last year. I found this $25 chest on sale for $10, added in my 30% employee discount and it was impossible to resist! 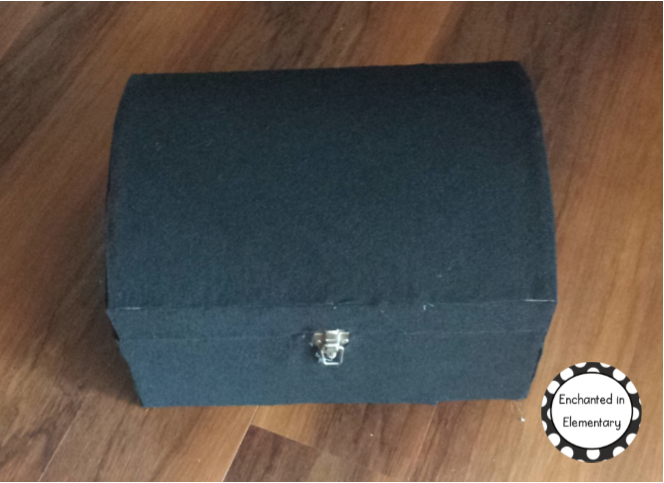 Obviously, the princess design was not going to work, so I started my treasure chest makeover by covering it with black felt. It took quite some time and I may have trimmed some of the edges too close, so I added pink ribbon along all of the seams. 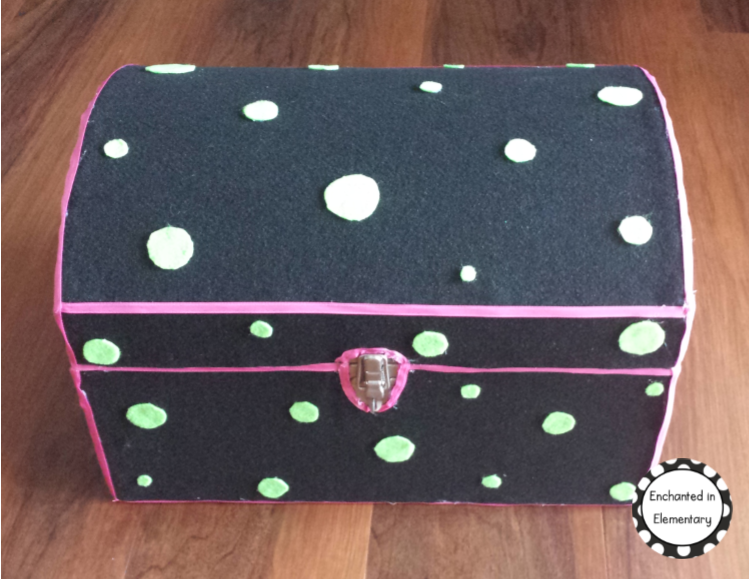 It still looked too plain for me so I added some green felt polka dots. All done! The inside is still princess-themed, but I can't seem to summon the energy to do it this year so it will just have to wait until next year! That's it for my Monday Made It! 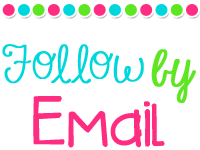 Remember to enter my TPT gift card giveaway, it ends tonight at midnight! 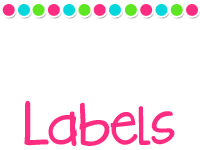 Winners will be picked and emailed their certificates tomorrow morning, so you will still have plenty of time to shop the TPT sale if you win!